“Arte Factum” is a sci fi anthology film by “Wages of Cine” productions. Written and directed by Dan Beck and Duane Brown. As an anthology, Arte Factum is composed of several different short stories connected by a central theme. In this film, each tale revolves around an ancient relic referred to as the Arte Factum, a mysterious orb containing boundless power, which drastically alters the lives of all those who encounter it. The central story is situated at the Seven Bowls Tavern. A western style bar located in the middle of a nameless desert. Seeking the power of the Arte Factum, a woman enters the tavern where she meets a mysterious cloaked man. The man reveals the secrets of the Arte Factum through twelve stories about people whose lives permanently altered through their interactions with the Arte Factum. The most striking element of the film involves the chaotic nature of the Arte Factum itself. Defying logic and existing beyond the confines of time and space the Arte Factum can appear anywhere and during any time period, therefore the stories span various time periods and settings from the middle ages of Europe to a distant future set in the far reaches of space. There’s no apparent logic regarding where the orb will appear. It manifestations seem completely arbitrary. The Arte Factum acts as a force of nature, free of moral judgement its influence is unbiased and acts without regard for anyone unfortunate enough to find themselves within its power. Through the Arte Factum, some characters find salvation, ultimately benefitting from its presence. Others are less fortunate find undue suffering at the orbs presence. No one safe from the unpredictable nature of the Arte Factum. Fate is taken away from those who find the orb as they unwittingly surrender their autonomy. The themes showcased throughout Arte Factum are perfectly summarized in the word of author H.P. Lovecraft, which briefly appears on screen as the film transitions from its first half to its second half. “The world is indeed comic, but the joke is on mankind”. This quote encapsulates the futility of struggle and forced submission experienced by of the characters of Arte Factum, whose self-determination is abruptly stolen from them the moment they came into contact with the Arte Factum. The horror of finding yourself helpless in the face of forces beyond reason and comprehension is both intriguing and unsettling. The acting in Arte Factum is exceptional overall. While some performances came off as more experienced than others, there were no performances that broke immersion of the experience. This was helped greatly by the professional sound quality which was clear and concise while also remaining consistent throughout the film. Despite its overall high quality, there were two noticeable problems in Arte Factum that were difficult to avoid noticing. The first problem involved the action scenes. During the physical confrontations the scenes would inexplicable slow down just as a punch or a strike was launched. This effect unfortunately broke some of the tension in what was intended to be scenes. However, this scenes were few and when put into proper context, these scenes were done quite well when the budget of this independent film is taken into consideration. The second issue was in regards to the usage of CG. In general, I am not a not a fan of CGI, preferring practical effects if necessary. However, I am aware that practical effects can only go so far in regards to things such as explosions and background effects. Unfortunately, with the vast array of multi billion dollar CGI film, it’s difficult to avoid noticing cheaper and less realistic looking CGI. This is just an unfortunate reality of modern day film, and should not be held against the film and detract from its overall quality. In conclusion, Arte Factum is a well-constructed film that explores complex topics in an intelligent and entertaining manner. Each story helped build upon the mystery behind the Arte Facte, culminating into a satisfying film experience. *Special thanks to Dan Beck and “Wages of Cine” for their support of the show. This entry was posted in b-movie bros, cult movies, Director's Showcase, Requested Reviews, reviews, Written Reviews and tagged B-Movie Reviews, Requested Reviews, reviews, Written Reviews. The Debt Collector is a 2017 crime drama, written and directed by film maker Jay Jennings. The movie follows a day in the life of Teddy Greene, a debt collector assigned to appropriate the growing debts accumulated by various clients around the city of Los Angeles. Teddy’s interactions with various clientele differs from person to person depending on the situation. He has a natural gift for analyzing his surroundings and surmising the best strategy for sending an intimidating message that will ensure desired results. This occupation would require Teddy to play many different characters depending on his situation. At times acting as a concerned and sympathetic friend, and instantaneously switching to violent sociopath assaulting his client and degrading them into submission. It was impossible to know which character Teddy would play when interacting with others and if his act would abruptly change. This added a level of excitement and unpredictability to each encounter. The film was narrated by Teddy himself in the style of a 1970s crime drama. This narrative choice provided a glimpse into the complex and at times contradictory mindset of the debt collector. As a debt collector, Teddy’s world view is overlaid with an overt nihilistic and morally relativistic perspective. He takes no moral stance regarding his the violence actions, nor does he attempt to justify them as anything more than the cost of doing business. In Teddy’s eyes, his work is little more than one part of the chaotic and meaningless world he just happened to be born into. His clientele range from poor drug addicts and prostitutes, to well off college students. However, the differences circumstances and life choices amongst clients are irrelevant to Teddy. They’re all simply a means to an end regardless extraneous factors. They will pay him their debts, or they’ll suffer the consequences. Despite Teddy’s ruthless outlook regarding his job, it would be disingenuous to consider him nothing more than an unfeeling nihilist. The scenes where Teddy isn’t working show a different side of him. Fondness for music as well as loyalty towards his friends are both apparent through his various undertakings. In one scene, Teddy gives money to a friend going through financial difficulties without any intent on ever being paid back. While this act may appear to contradict Teddy’s personality, it actually gives him depth of character that isn’t overtly apparent on the surface. This also establishes Teddy as an unreliable narrator, putting on a veneer of stoicism and shielding an array of emotion that even he may not be aware of himself. Through a series of unwise decisions and betrayals, Teddy becomes an enemy of his employers. This ultimately forces him to leave town and go into hiding. In the final scene, it is stated that Teddy wishes to return to his life as a debt collector after his present dangers have passed. This statement is significant because is shows that of this while Teddy may hold certain values, he is still struggling to come terms with the competing philosophies held by the two sides of his personality. The film is shot in a grainy black and white, reminiscent of classic noir films of the 1950’s. The sound and video quality are both top notch and the clean yet abrupt scene transitions helped keep this film flowing at a consistent and steady pace. Like all movies, The Debt Collector isn’t without it’s flaws. Although Teddy’s interactions with different clients helped develop his character, his later interactions seemed like virtual duplicates of conflicts he had prior. The shake downs and intimidation attempts began to feel repetitive after awhile and did little advance the plot. The climax, where Teddy confronts his former employers, is briefly shown at the start of the film. This made the events in the movie flashbacks told from Teddy’s subjective perspective. Unfortunately, the proceeding scenes did little lead into the foretold climax. This caused the ending to come off as rushed and the conflict seemed forced. Teddy had few interactions with his employers leading up to the final act, making the sudden betrayal and subsequent escape seem random and nearly unprovoked. The Debt Collector can best be described as a case study into the mind of a man attempting to reconcile two different sides of his personality. On the one side, Teddy adopts a dispassionate and existential mindset necessary to endure his violent occupation. On the opposite side, Teddy’s genuine concern for others and appreciation for life outside his job shows a man with an inherent desire to find meaning within a seemingly meaningless world. The Debt Collector is an interesting and well crafted story that manages to create an unexpectedly complex character. While the conclusion felt rushed, the story was well constructed and the stylistic choices created an engrossing environment that managed to be entertaining throughout it’s hour long duration. I would recommend The Debt Collector to any fans of crime dramas, or to anyone who can appreciate the steady character development of an unlikely protagonist. This entry was posted in Requested Reviews and tagged Requested Reviews. 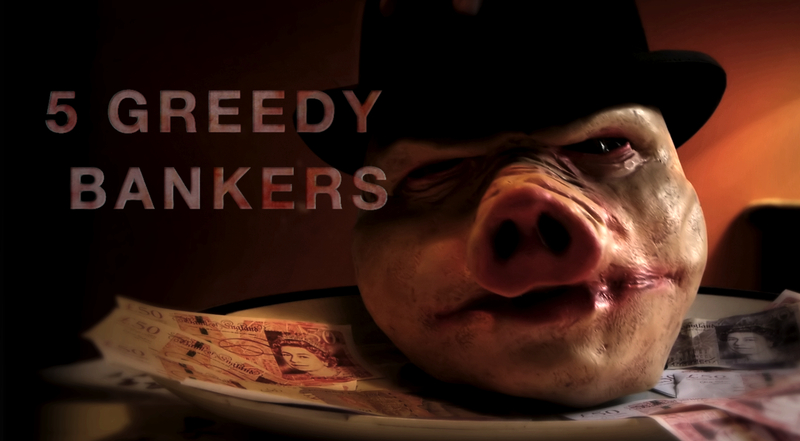 5 Greedy Bankers is a Heist film directed by Simon Davison and starring Pippa Haywood, and Ramon Tikaram. The story revolves around a shamed ex-banker named Catherine Stone (Pippa Haywood) who teams up with a group of anarchist, lead by a mysterious man named Fidel (Ramon Tikaram). Stone and her new acquaintances each have their own grudge against Stone’s greedy, power hungry ex-employers and decided to extract revenge by attempting the five lead bankers for years of corruption and greed. The early revenge plots primarily take the form of juvenile pranks, such as tricking one banker into cross dressing in public and getting another banker attacked by a pig. These early schemes play out in a manner that resembles a unique cross between “Oceans Eleven”, “Boondock Saints” and “Home Alone”. The group picks a target for their revenge, they study his/her personality quirks and weaknesses, then they set up a trap in which the greedy banker inevitably falls victim to. Elaborate traps using common household items are often utilized for quick escapes.These early scenes are fun, and it’s impossible not to enjoy seeing such despicable characters as the targets of these otherwise benign tricks. What separates “5 Greedy Bankers” from most other revenge films is the recurring question over how relevant these seemingly immature acts of revenge actually are. The younger members of the group hold more ideological views. They believe that with each act, they are making a difference in society, helping to end the pervasive corruption and eventually creating a world on equality. The older members such as Stone and Fidel reject these naive notion and insist that their petty pranks are simply self serving revenge tactics that will ultimately have no effect on the society as a whole. The differences in ideology cause friction between the group, eventually leading Stone to go her own way. 5 Greedy Bankers is a fun, action packed heist film, that offers an interesting twist to a common genre. The social commentary was well appreciated and added a much needed extra depth to the story. However, the bankers themselves were portrayed simply as cliche villains that seem to be fueled by nothing more than sin and vice. The had no personalities other than the singular personality trait they attempted to embody. It can be reasoned that these villains were intended to act as personifications of greed, lust, aggression and corruption. If this is the case, than in-depth personalities would have served and unnecessary and at worst a hindrance to the progression of the story. However, for an otherwise very well crafted film, I personally would have appreciated more compelling and memorable villains. This entry was posted in b-movie bros, Requested Reviews and tagged Requested Reviews.